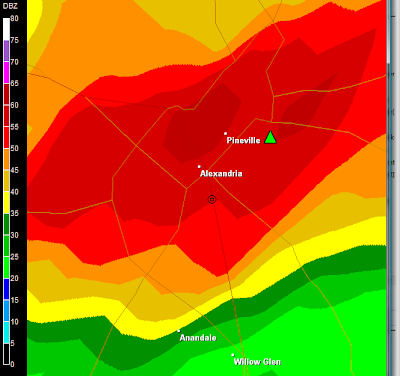 Severe weather passed over Alexandria at 10:41 a.m. They were under a warning. SOUTHWEST OF ALEXANDRIA...MOVING NORTHEAST AT 25 MPH. THE SAFEST PLACE TO BE DURING A TORNADO IS IN A SMALL INTERIOR ROOM. ALWAYS STAY AWAY FROM WINDOWS.